The hand-coloured postcard (click to enlarge) shows all three late Victorian additions to the Greens, as well as two new Edwardian buildings: the Pharmacy, recently re-fronted in Mock-Tudor style, and the Bank and Bank House newly built just a few years previously. Growing through the pavement nearby was a large elm tree, often mistaken in photos for the Jubilee oak tree which grew very slowly; the elm was cut down in the 1940s. 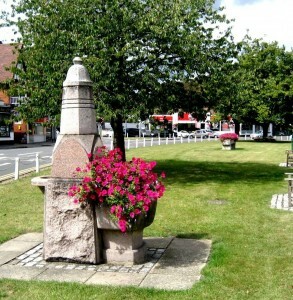 Although it is not a memorial, the fountain was the first public monument to be erected in the centre of the village. It was the philanthropic gift of Lady Georgiana Needham, following the principles of the Metropolitan Free Drinking Fountain Association. Lady Needham, daughter of the Earl of Kilmorey, lived at Datchet House and was the grandest lady in the village. In 1886 she was in her ninetieth year, one of a family who all reached similar great ages. 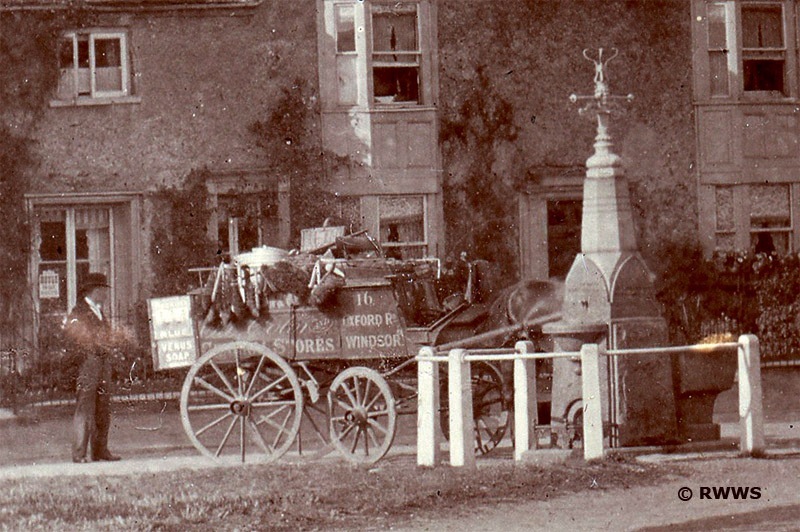 A typical Victorian monument, it bears biblical quotations on the subject of water while providing bowls for dogs and horses as well as villagers. The inscription round the bowl records that it was the gift of the Lady Needham of Datchet House to the people of Datchet. It is made from Aberdeen granite, a monumental stone which was very fashionable at the time. 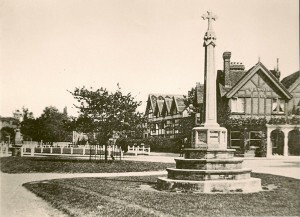 Originally it had a light on top and stood right in the centre of the village. 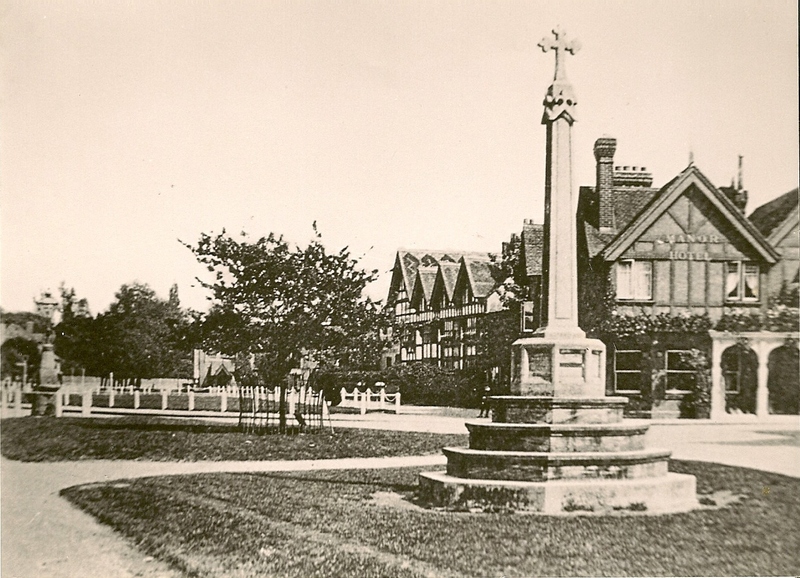 By the mid-20th century it had become an obstruction to traffic and was in danger of being damaged itself, so it was removed to the grounds of Churchmead School where it languished for many years. 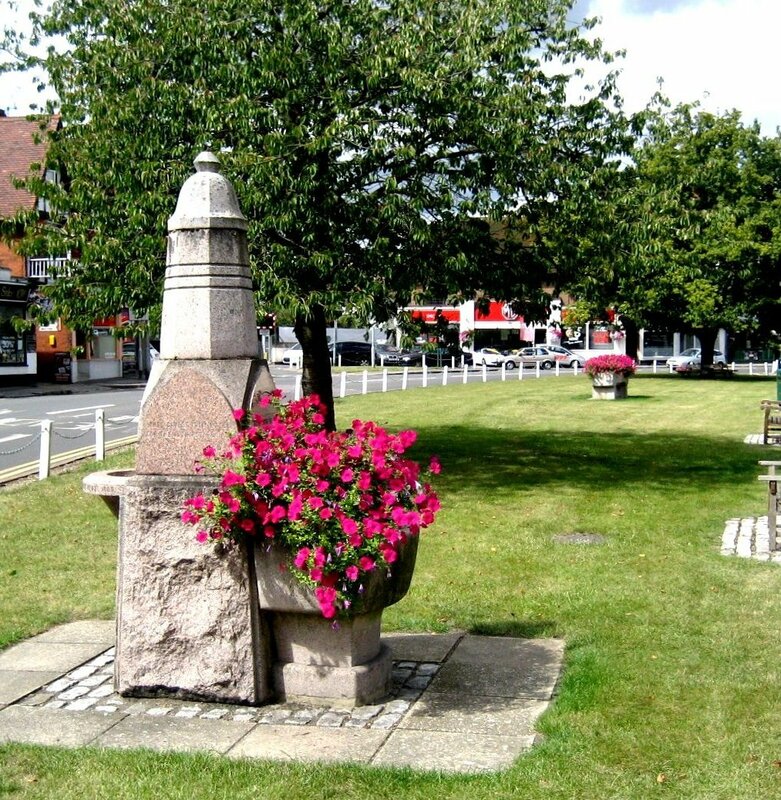 The fountain has now been restored by the Barker Bridge House Trust and brought back to the village centre, in a safe place on North Green and with a replacement top section because the original had not survived. The ‘new’ photo, above and detail, is from the Royal Windsor Website, a postcard image taken from the top of the High Street. It dates from the late 1880s or 1890s as the drinking fountain was built in 1886. 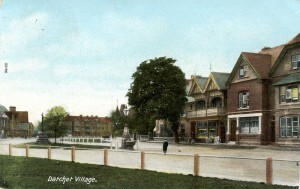 The old houses seen behind the fountain were demolished in the early 1900s for the Bank and Bank House to be built. 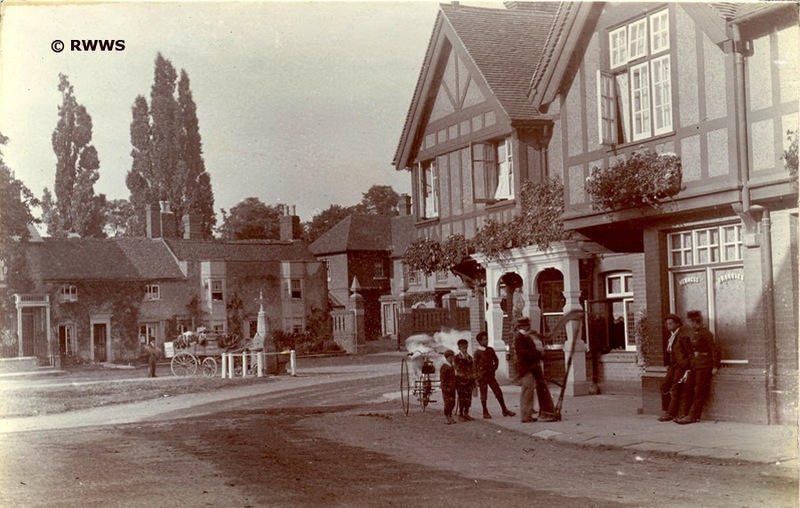 A harp can be seen being brought into the Manor Hotel, watched by the inevitable group of small boys, and was presumably for a musical entertainment. The man with the cart was from the General Stores in Oxford Road, Windsor, selling or delivering brushes and brooms locally. 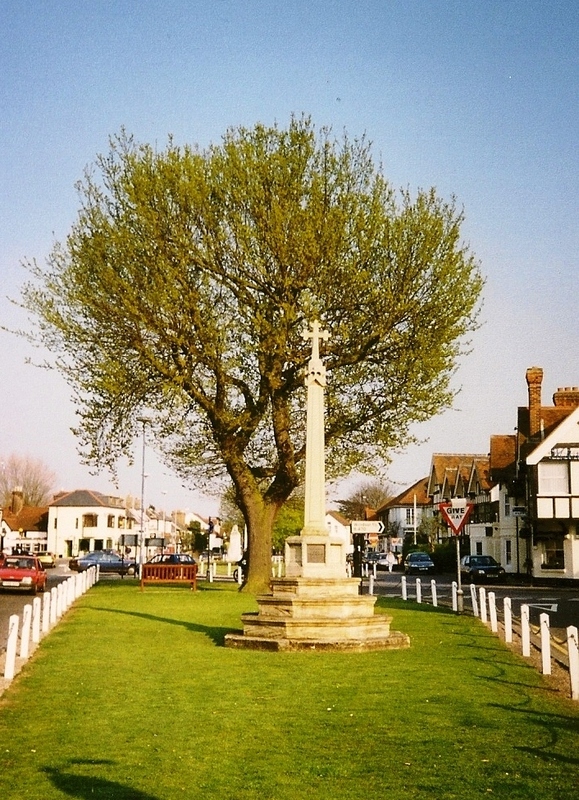 Datchet marked the Queen’s Jubilee by the planting of this tree, given from Ditton Park by the Lady of the Manor, the Duchess of Buccleuch. It was planted by the schoolchildren as a small sapling and only grew very slowly to its present size, now dominating the centre of the village. The Duchess also provided the day of village celebrations in Ditton Park, where Queen Victoria herself was driven around the crowds; the Duchess and the Queen were close friends. The festivities began on Tuesday 21st June with a Thanksgiving Service in the Church at 12 o’clock. Then the choir and schoolchildren left the Church in procession, carrying an oak tree and singing the National Anthem. 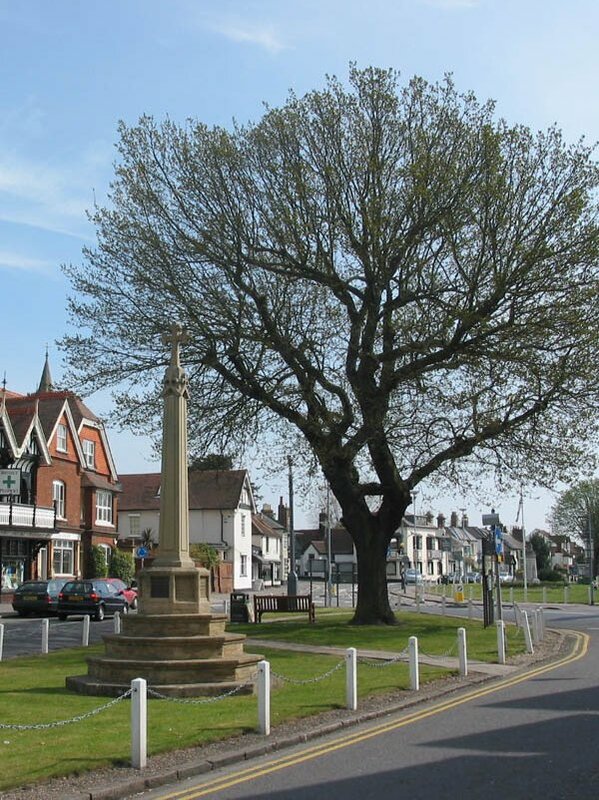 On arriving at the Village Green, the head boy and head girl of Datchet School planted their Victoria Oak, which was the gift of Her Grace the Duchess of Buccleuch from Ditton park. The other children assisted by filling in the earth afterwards and treading it in, all the while singing the National Anthem. After long cheering for Her Majesty the Queen, three cheers were given for Her Grace the Duchess and another three cheers for Lady Georgiana Needham, who was greatly pleased with the affectionate regard shown to her by all the villagers, she being the oldest inhabitant and in her 92nd year. The children returned to Datchet School where they were each presented with a Jubilee Commemoration medal attached to a blue ribbon. About mid-day on the following Tuesday, the children of Datchet School proceeded to the lawns in front of the stately old mansion. The children had their dinner in a marquee, served by the ladies of the parish, including the Duchess and her daughters. After tea the children were entertained with Punch and Judy, steam roundabouts and other amusements, until about 6.30 when they assembled in the marquee for tea.After tea came the principal event of the day’s proceedings. The Queen had graciously promised to drive to Ditton Park in the evening. In addition to the children there were about 500 persons in the grounds. As the Queen’s carriage came in sight, vociferous cheering, led by the children, greeted Her Majesty, who appeared very pleased by the warmth of the reception. The principal inhabitants were presented to the Queen in her carriage and the National Anthem was heartily sung. The gathering was truly a striking one. The greatest monarch in the world, amongst eight or nine hundred of her subjects, receiving from them tokens of their love and loyalty, showing a warm interest in their enjoyment, bowing left and right to all present. And this among the most charming woodland scenery, illuminated by golden evening sunlight – it was a picture which will never fade from the minds of those who had the good fortune to gaze upon it. On this occasion Mrs Crake of The Lawn in Horton Road, one of the grand and wealthy ladies of the village, had persuaded the new (civil) Parish Council that a cross of a medieval Somerset type would be an appropriate memorial. Originally there were two plaques but the one recording Mrs Crake’s gift has disappeared. On the east face of its octagonal base is a brass plaque commemorating the Queen’s Diamond Jubilee, with biblical quotations, while on its west and south faces there are now plaques recording the Silver, Golden and Diamond Jubilees of Queen Elizabeth II. 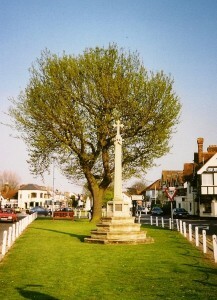 The handsome village cross which Mrs Crake has erected at Datchet was unveiled on Thursday. Mrs Crake has lived in the parish for 70 years and is one of only five people who were alive there in 1837 at the time of the Queen’s accession.There was a very large attendance of inhabitants and villagers, and the village wa gaily decorated, the Union Jack being displayed by many houses. However, the Drinking Fountain which the late Lady Georgiana Needham provided for the village appeared neglected, and it would have been left without adornment if old Mr Crude, who was gardener to the late Lady Needham, had not managed to borrow a flag and get one of the more nimble villagers to affix it to the summit. Punctually at half past twelve the Vicar, with the choir, started from the Church and took up a position near the cross. A hymn was sung and prayers were said. Mrs Crake then pulled the cord and the covering fell to reveal the handsome cross. The National Anthem was sung and three cheers were given for the Queen and for Mrs Crake. On Friday 200 of our children from Datchet joined in the great entertainment of over 6000 in the Home Park. There, refreshments in the shape of milk and buns, specially sent by the Queen, were provided for them on their arrival.Games and swings followed, after which the children were marshalled in due order, and when the Queen arrived and drove slowly round the great circle, the thousands of children joined in singing the National Anthem with an enthusiasm which could not be surpassed. Afterwards, tea was served in tents, with an abundance of cakes and other delights. Then the great assembly broke up after a very enjoyable, though somewhat fatiguing day. Some of the little ones gave way through the heat and excitement, and perhaps through the frequent use of swings, but they were speedily attended to by the ambulance corps and we have heard of nothing serious having occurred. 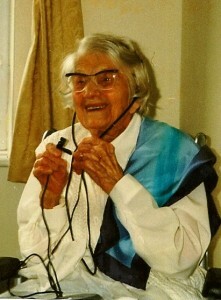 Mrs Florence Rawlings was aged 109 when she died in 2001, seen here on her birthday. She still recalled going to this party in the Home Park when she was five years old. She remembered walking from Datchet along the road to Windsor to see the Queen and that she was very young and it seemed a long way. She also remembered other occasions when she had to get out of the way of Queen Victoria’s coach driving through the village, even diving into a ditch if necessary, while the girls curtseyed and the boys bowed. 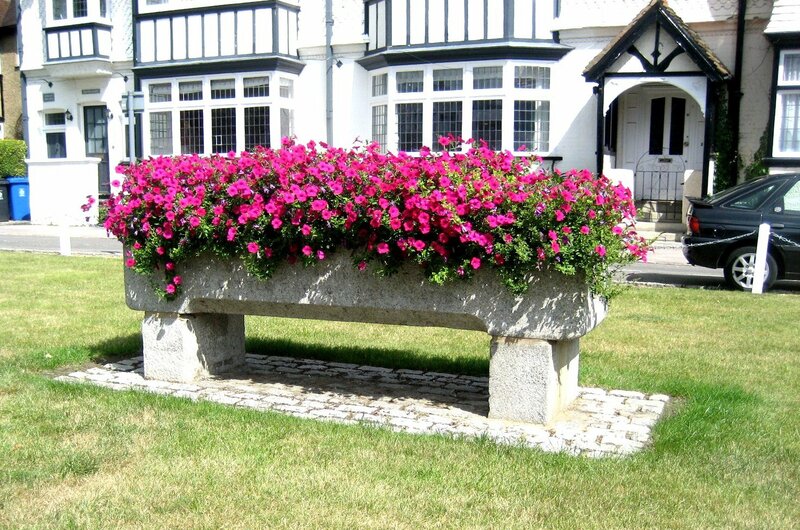 This huge stone trough did not originally belong to Datchet but was given space here when it had to be removed from the Windsor Road; from exactly where or when is not yet known. 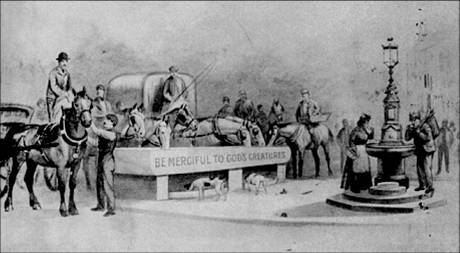 These water troughs were provided by the Metropolitan Drinking Fountain Association which changed its name to include cattle troughs in 1867, to support animal welfare as well. It still exists as the Drinking Fountain Association, now mapping and recording drinking water fountains. 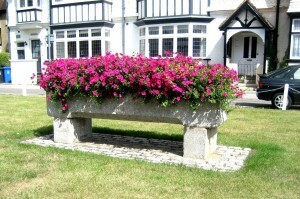 This one has become an over-sized planter, kept full of flowers by Datchet Parish Council. Lady Needham was not alone in her gift to the village; the idea of freely providing clean water for working people was a national topic in Victorian times, when drinking fountains were installed by philanthropic people, societies and local authorities. This drawing, from the Metropolitan Drinking Fountain Association’s journal, could have been the inspiration for Datchet’s fountain, with its bowl for dogs and light on top, as well as for many hundreds of others across the country. And while there was no horse trough in the village, only the fountain’s bowl, the trough from Windsor Road has now joined it to complete the scene.